Amy Foster produced encouraging early-season form in the US as she was .01 outside the 100m Irish record mark that she jointly holds with Ailis McSweeney. The City of Lisburn athlete, 26, clocked 11.41 in a meeting at the Clermont track in Florida. 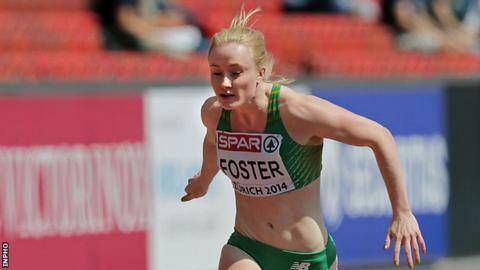 Also at the meeting, Foster produced one of her fastest ever 200m times as she crossed the line in 23.55. Foster's 200m run was aided by a wind speed which was marginally over the legal limit of two metres per second. Paul Pollock, meanwhile, ran a time of 14:11.09 for 5000m at the British Milers Club meeting in Manchester on Saturday as he took third place. Pollock finished behind Britain's Andrew Heyes (14:01.30) and Ennis athlete Kevin Mulcaire who broke John Treacy's 40-year-old Irish junior record of 14:04.6) as he clocked 14:02.30. UCD athlete Ciara Everard finished fourth in the women's 800m at the BMC meeting in 2:03.24 while Claire Tarplee was seventh in the same race in 2:11.74.